Anti-government protesters create a burning roadblock, including the use of a car, during clashes with security forces as they show support for a mutiny by a National Guard unit in the Cotiza neighborhood of Caracas, Venezuela, Monday, Jan. 21, 2019. Venezuela's government said Monday it put down the mutiny. 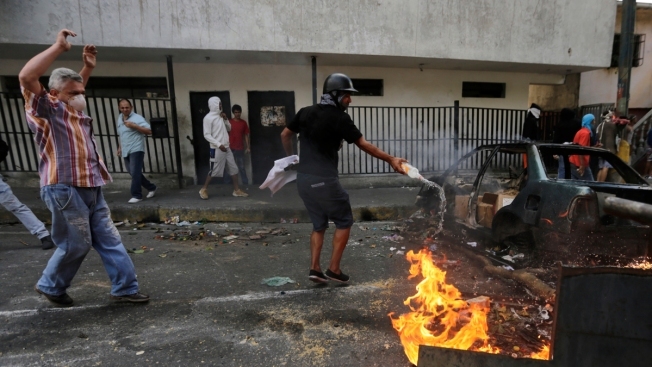 Venezuela plunged deeper into turmoil Monday as security forces put down a pre-dawn uprising by national guardsmen that triggered violent street protests, and the Supreme Court moved to undercut the opposition-controlled congress' defiant new leadership. Juan Guaido, a 35-year-old newly seated as president of congress, shrugged off the court's warning and reiterated his call for people to take to the streets Wednesday — a historic date commemorating the end of Venezuela's military dictatorship in 1958 — to demand Maduro abandon power.